The Where’s the Gold slot machine was created by the Aristocrat group and launched in 2003, which means that today it is a classic of the five-spinning pokies machines; but it can be found in absolutely all the casinos of the world, then at least in a great majority of them. This game has a colorful, almost childish theme, in addition to its good bonuses. It is also one of the many games made by the Aristocrat Gaming group that has recently been available on the internet thanks to the company NYX Gaming, responsible for the demo version. This company, Aristocrat Gaming, seems to have no interest in implementing any soundtrack to its slot games, not only Where’s the Gold, but a lot of other games. Instead, it puts all the attention on the quality of their bonuses, awards and visual effects that may have their different themes. The theme of the pokie machine includes in it an adorable miner, who is in the search for all the gold he can find and thus become madly rich. The graphics that accompany the small miner are a small cargo cart, the mine, different shovels and picks, do not forget the dynamite and the poker cards that include the letter K, letter Q, and letter J, number 10 and 9. Impressively, this game, unlike others, has up to eight different types of graphics that are “Where’s the Gold wilds”. How to know what they are? You will have to look for those graphics similar to the previous ones, but that shine more than any other, those that are complete of the beautiful golden shining and extremely valuable. Of course, no matter how important the gold is, as a wild symbol it cannot replace the scatter chart represented by the dynamite graph. Where’s the Gold has a return to the player index of up to 94.921%, this means that if the player decided to bet about one hundred Euros, after a fairly large number of spins, he should win 94.92 Euros at least. The more turns you make, the more likely you are to win more and more money back. The Where’s the Gold machine requires a hardware called Aristocrat MKVI, said MKVI gaming hardware took place in 2002 and still remains today lasting a little more than a decade; which has a fairly modest resolution that is up to 640x480, this only needed and implemented for the Where’s the Gold Slots game among other games located in land-based casinos. The current amount of online slot games is completely impressive, not only the free versions of those games but also where it is possible to bet real money, it is a long list, in fact. Aristocrat Gaming is one of the companies that was immersed in the whole issue of betting machines available on the internet. There you will easily find this Where’s the Gold Slots machine; because the different supplier companies know how extremely important it is to bring the games closer to those people who cannot move to a casino on the ground, but who nevertheless have mobile devices and computers worldwide. Where’s the Gold is a very popular game, and maybe it’s because of its bonuses, which are more than just modest or moderately nice. It has one thousand credits, five reels and twenty-five lines of payment. The player must be attentive to get three, four and five dynamite graphs, you will get at least ten free spins. The screen has an animation that will activate automatically and the screen will react to the explosion of the dynamite that will transfer everything to functions now available. This consists on the choice between several mining friends, among them will appear HappyLucky, Professor Gold, Nugget Ned, Mary Money and Find the Dog; After choosing the favorite miner you will win a predetermined amount of additional spins, re-elect options or the extra wildcards option. The player will choose his miner and everyone digs at an accelerated pace; When they reach a depth of about one meter, the miners will make public the number of prizes that were obtained, the player will only manage to stay nothing else and only with the prize that the miner of his choice obtained. What nerves! This animation is extremely creative and keeps the game with a completely different and unique aura and visual effects, because the bonuses will not be the only highlight of this slot game, but you will enjoy every detail perfectly designed to ensure more entertainment for the players. 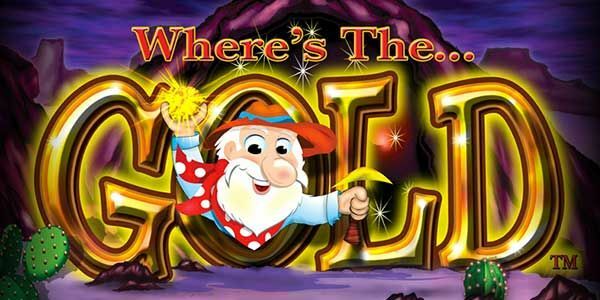 Where’s the Gold is an extremely fun and entertaining game with much more creative features than other simple classic slots. In Where’s the Gold players have a fairly extensive list of combinations that will lead them to victory. As in any other game, players will choose the pay lines they wish to activate, as many as they want. This feature is very attractive to so many players from different budgets available at hand. None will be left out. Do not trust, however. This game has a high frequency to changes; the player can win round after round different prizes, however, the really big winnings will not be easily presented, which makes it highly entertaining, always looking for bigger and bigger prizes, so you’ll have a good time playing this slot. Slot games like this that present volatility in this way, become very fun and entertaining, the excitement of the players will stay on top knowing that a really fat prize may be around the corner. This brings an increase of instant adrenaline. Where’s the Gold is a pokie game that reminds all users the value of this chemical element, as it does not matter the passing of time or the economy that any nation may present; Gold will always be gold and its value cannot be compared. Gold has this bright feature similar to the sun, this game is inspired by the value presented by coins, jewelry, dishes, gifts, decorative elements, everything while containing gold in its structure results in many gains; that is clearly the inspiration of this game, the miners want to have fun and share their gold with their players but first the mission is to get the gold. As assistants to these pleasant miners, players will see no need to return experts in digging or how to use a pick and shovel. Despite being a very different slot machine, it still has the basic and classic buttons that all users of this type of games know. On the screen of these machines are available to the naked eye auto play buttons, gamble, information related to the activated lines, the bet for each of them and the final bet, in addition to the menu with many other options. If a beginner wants to play this game, it will be enough to choose a sum of money for the bet, choose the lines that will be activated to play and press the spin button, which can be replaced by the spin auto if he wants to do so. The Where’s the Gold machine requires a hardware called Aristocrat MKVI, said MKVI gaming hardware took place in 2002 and still remains today lasting a little more than a decade; which has a fairly modest resolution that is up to 640×480, this only needed and implemented for the Where’s the Gold Slots game among other games located in land-based casinos.